The 2018 Honda Accord has a 1.5-liter turbocharged engine and a CVT type of automatic gearbox or an optional 2.0-liter turbo four that's paired with a 10-speed automatic transmission. There is also a six-speed manual gearbox available on the Sport trims of either engine. Some reviewers found that the Accord was a bit noisy on the freeway, the grille to be a bit fussy, and the new design negatively impacts visibility. 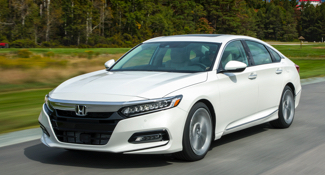 But overall the 2018 Accord is considered one of the best sedans -- of any size -- available on the market, given its upscale amenities and build quality, performance of the engines and overall handling. The Honda Accord was redesigned for 2018, and its interior and exterior qualities were dramatically enhanced. I drive the EX-L model, which gives a full suite of safety features, a moonroof, leather seats, 18-inch alloy wheels, and Apple Carplay (I believe Android Auto as well, but I don't have an Android device). The exterior of the car does a great job at balancing the aggressive aesthetic cues common in newer sedans competing for a smaller share of the auto market, while retaining its conservative overall design language without appearing too boring. The rear headlamp shape is the only design feature I take issue with and wish they had done a better job. The interior is really where this car shines above the competition. The layout of the center console is very intuitive, simple, and sleek. Although adorned with faux aluminum and wood, the console looks gorgeous. The climate control knobs also change color to blue if lowering the desired temperature, or red if raising it. The touchscreen console is a tablet like design that is very common, but I think it still looks professional. Leather padding and soft touch materials are in all of the sweet spots, and the leather seats are very soft. Two-way programmable, and 12-way adjusting power drivers seats are a very luxurious touch. The drivers gauges feature an analog speedometer, and a digital second screen which can house a tachometer, along with a myriad of other options, such as entertainment information or fuel economy. I would prefer the option of a digital speedometer, which I don't believe is available. The 1.5L turbocharged 4 cylinder engine providers enough power to keep you feeling comfortable with highway speeds, and the fuel economy numbers were mind blowing. Everyday commuting with 90/10 city/highway mileage split gives me 33.3mpg with eco mode engaged and conservative driving habits. Took a trip through Arizona's freeways. It was absolutely amazing to be able to hit the adaptive cruise control and relax my feet while the car kept me at a proper distance from the car in front of me. 2018 Honda Accord - So far, so good! I really like the design of the new Accords. I think they look stylish and say luxury vehicle all over it. I really like the feel of the seats. When I took my weekend trip, I felt like I was riding on the couch! It was a very comfortable ride. Not to mention the handling of the vehicle felt very smooth. Driving up to Maine for my cousin's wedding in this vehicle made it worth it. Great on gas and comfort. The space you have in the vehicle is unreal. I really need trunk space, and I was able to fit the stroller comfortably with room for the diaper bag, grocery bags and other junk. I also love the comfort driving, the seats made an hour-long drive bearable. You are just relaxed in this vehicle. One of the negative things for me is that they do not offer it in coupe style. I usually have two vehicles. One would be an SUV, and I like my personal, fun car to be a coupe, so I am really disappointed they do not offer it in that style, but it shows how much I like this vehicle since I still went with the sedan option rather then getting a different vehicle. The only other thing that was negative for me is the radio. It sticks off the front and comes up not attached to the dash. I think it is an awesome radio itself. I just do not like the design of placement in the vehicle. I think that the vehicle should of had it in the style where the radio would inject itself into a small slot. (hide itself) I have seen them aftermarket so I know it's possible to do. I think without having that option, someone from the outside might think it's this fancy aftermarket one and break into the car and try to steal It.